A few months ago I was asked to prescreen the movie “The Identical.” I received a media packet that contained two movie tickets which allowed me to invite my best friend. It was a wonderful time of fellowship! This year, faith-based movies are being recognized by the mainstream media, more so than years passed. Although it’s too early to tell, but it appears the directors and producers of faith-based films are building a foundation in Hollywood. The charts are showing them very high in ratings! In my personal opinion as a Christian, its high time some class and morals returned to the big screen. 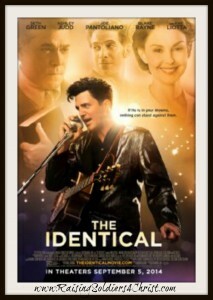 When I watched the preview for “The Identical” I wasn’t sure if I would enjoy the movie. However, as the old adage goes, “never judge a book by its cover.” When the movie began, I was immediately sucked in. So many of my family members were big fans of Elvis Presley and this movie reminded me so much of him. Though this movie is not a film based on the life of Elvis, it brings to mind the similarities from that time period, the story line and the music. In 1936, William and Helen Hemsley welcome identical twin boys into the harsh conditions of the Great Depression. When traveling evangelist Reece Wade reveals that he and his wife cannot have children, William feels the Lord’s prompting to give them one of the infant boys in hopes of that son obtaining a better life. City of Peace Media and Capitol Christian Distribution announce THE IDENTICAL SOUNDTRACK set for release on September 2nd. THE IDENTICAL a City of Peace Films/Freestyle Releasing feature film starring Erin Cottrell, Amanda Crew, Brian Geraghty, Seth Green, Ashley Judd, Joe Pantoliano, Blake Rayne, and Ray Liotta, is slated to hit theatres nationwide September 5th. The double soundtrack spans 3 decades of pop music and features the music heard throughout the film, including twenty two original songs such as: ‘BeBoppin Baby’, ‘Better Man’, ‘Boogie Woogie Rock and Roll’, ‘Gypsy Man’, ‘Sunrise Surfin’, ‘You’re Loves Keeping Me Tonight’, ‘City Lights’, and ‘Nashville Tonight’ performed by lead actor Blake Rayne. Additionally, the soundtrack features songs from City of Peace recording artists, The Morph Kings and Darcey & Mo as well as score for a total of 30 tracks on 2 discs. THE IDENTICAL SOUNDTRACK is produced by Yochanan Marcellino and his father Jerry Marcellino, a veteran musician, producer, and songwriter with 17 Gold albums, 6 Gold Singles and 3 Platinum albums. Jerry produced many of Motown’s top talent during the 1970s including Michael Jackson, Diana Ross and the Supremes, Lionel Richie & the Commodores and Smokey Robinson. RYAN WADE (Blake Rayne) grows up during the Great Depression as the only child of a country pastor (Ray Liotta) and his wife (Ashley Judd), unaware he is not their biological son, but one of a pair of identical twins born to a poor couple in the church who gave him to the Wade family and kept his brother to raise themselves. Ryan grows up encouraged by the Wades to pursue the pastorate a goal he grows increasingly disinterested in as he begins to dabble in his lifelong love: music. Tensions with the Rev. Wade come to a head when Ryan decides to drop out of seminary and pursue music full-time with his best friend (Seth Green). Encouraged by his wife (Erin Cottrell) and employer (Joe Pantoliano), Ryan embarks on an unpredictable, provocative path – performing the legendary music of Drexel Hemsley in sold-out venues all across the country. But when the two men s destinies tragically collide, Ryan discovers Drexel is more than just his inspiration: he s his identical twin. A reeling Ryan is left to question everything he’s ever believed about God, family and his own identity. 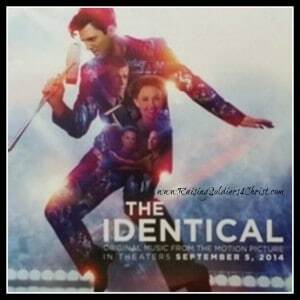 THE IDENTICAL is a City of Peace Films production featuring the talents of three generations of the Marcellino family from Nashville, TN. Dustin Marcellino is the first time director; Jerry Marcellino co-wrote the 22 original songs with his son Yochanan, who is the founder of City of Peace Media & Films. The movie will be distributed by Freestyle Releasing and will be opening nationwide on September 5th. Blake Rayne is new to the film world, but has years of stage experience, working as a City of Peace recording artist. In his acting debut in THE IDENTICAL, Rayne plays the dual role of Drexel Hemsley and Ryan Wade. Rayne’s film debut also includes his performance of many of the original songs in the movie. Appearing with Blake on tour and also in the movie are R&B group, Darcey & Mo (like a modern-day Sam & Dave) and The Morph Kings, a throw back to Led Zepplin, Pink Floyd, ala a taste of today’s Black Keys. I am a music lover and band geek at heart! Blake Ryan and the other artists did a wonderful job with the soundtrack. I can not elaborate enough how captivating the music in this movie was for me. Two of my favorites are “City Lights” and “Your Love’s Keeping Me Tonight.” I am excited about the release of both the movie AND the CD!!! I think this is a good one to have in your home library. Oh, I almost forgot to mention, if you read my post HERE about music choices, you will know how important it is for me to have good CLEAN music available. This CD fits that! My kids loved it and so do I!!! I highly recommend it, giving it a 5/5! Click to enter the giveaway!!! Previous Post: « Modest Monday: Jade Mackenzie Apparel and GIVEAWAY!